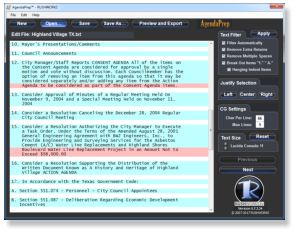 AgendaPrep™ is a text editing and formatting utility that converts meeting agenda items into PNG files for use with many production systems. The converted files are placed in a folder and numbered for sequential selection and display. 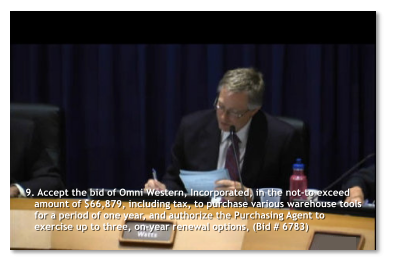 Select a background color and opacity to provide better definition for the characters over the live meeting procedings. 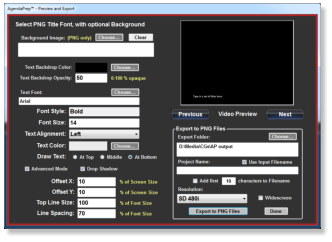 AgendaPrep allows anyone - regardless of their knowledge of graphics and/or video - to format plain text into PNG files that are appropriate for graphical display in video production. 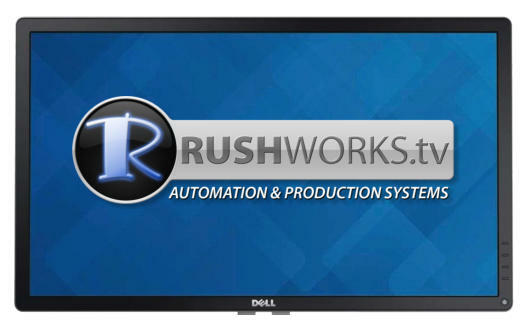 Enhance your productivity and save hundreds of hours by eliminating redundant data entry and reformating of graphics. 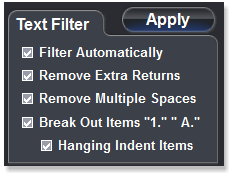 Open an agenda text file, then click Apply for the selected formatting rules. The text is automatically divided into blocks that can be exported as PNG files to a folder. Click Preview and Export to open this properties window that lets you select font parameters for the output. The Video Preview window displays in real- time the output of the text block you’re editing, so there are no surprises when you’re done. Items not conforming to your selected rules have a red background. Just edit until you “get the red out” and your files are ready to export as PNGs.